The EU is currently negotiating an EU/India Free Trade Agreement (FTA) designed to allow European capital to take over Indian financial and services through the 'liberalisation' of these markets. 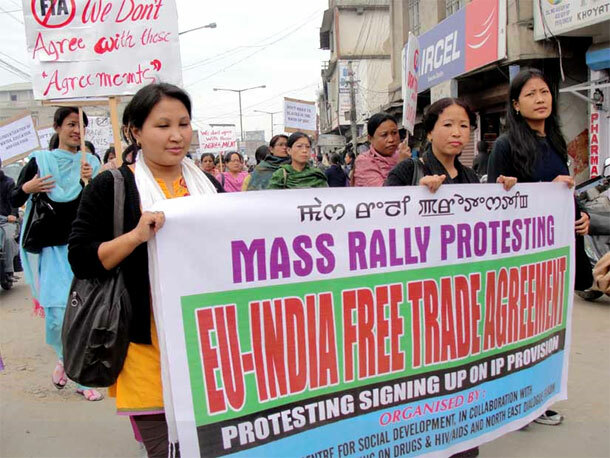 In return, India is demanding Mode 4 access to EU markets, a trade concession that allows transnational corporations to bring temporary workers from outside the EU into the EU on lower rates of pay. In other words, such a deal will mean mass privatisation and the opening up of Indian markets in return for importing a huge 'reserve army of labour' into the EU in order to batter down wages and conditions to increase corporate profits. Moreover, if agreed, such trade commitments are effectively permanent and irreversible under law. Under Mode 4 a firm with a contract in another member state can bring its 'own' workers, from inside or even outside of the EU known as Inter-Corporate Transferees (ICTs). European Court of Justice decisions , such as the Laval and Viking cases also reinforce the rights of corporations to exploit loopholes to undercut host country industry norms and trump the rights of business over those of workers' and unions. The Lisbon Treaty also further advances EU 'liberalisation' enshrined in the Services Directive and greatly increases the powers of the Commission to enforce such policies. This will lead to huge levels of social dumping as the 'free movement' of both services and workers continues to undermine trade union strength and pay rates, with considerable downward pressure on wages among the most vulnerable workers in the UK. Not only does this undermine individual workers and organised labour, but is directly detrimental to the national economy. The loss of tax and National Insurance payments, of the earn/spend cycle as cash is sent overseas and of a skills base for the future all harm the economy and only benefits tax-avoiding transnational corporations. Big business structures designed to promote corporate takeover and dominance within the EU are well-organised. The major lobbying mechanism on 'services' is the European Services Forum (ESF), closely connected to the powerful International Financial Services London (IFSL), now merged with the Corporation of London and UK Trade and Industry, into 'TheCityUK'. The broader structure for affecting EU policy is BusinessEurope, formerly UNICE, which has even shared offices with the European Commission. 'BusinessEurope' includes global firms such as US oil giant Exxon, and wields strong influence over EU internal and external trade policy. In India resistance to this corporate mass privatisation drive is growing. On May Day this year, C H Venkatachalam, the General Secretary of India's largest bank workers union, AIBEA, appealed to workers to come together to oppose the privatisation of the banking sector. He warned that "allowing full voting rights for Foreign Direct Investors in banks, increased FDI/Foreign Institutional Investors investment limit in the banking sector and higher FDI limits in the insurance sector are some of the major challenges which the bank employees cannot afford to ignore". It is time organised workers here stopped believing in euro fairy tales of 'social partnership' with their corporate executioners within the EU and started to defend themselves by following the example set by Indian workers. Also see the full text of the pamphlet "Social Europe is a Con" which has sections dealing with Mode 4. This is available here in pdf format.